The Winter Weather Preparedness Social Media Content Toolkit is now available. Winter weather Tweets and Facebook posts. Tips on how to organize a Twitter chat. Winter storms can range from a moderate snow over a few hours to a blizzard with blinding, wind-driven snow that lasts for several days. Be sure to take the necessary winter weather precautions in order to be best prepared! Get tips from the National Oceanic and Atmospheric Administration (NOAA) on being Winter Ready. Find additional tips below and head over to Ready.gov: Winter Storms and Extreme Cold for more information and resources. 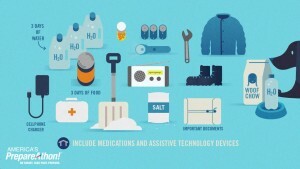 What is in your Winter Emergency Kit? Sufficient heating fuel since you may become isolated in your home and regular fuel sources may be cut off. Store a good supply of dry, seasoned wood for your fireplace or wood-burning stove. Share what is in your Winter Emergency Kit on the Community to help others be prepared for the next winter storm!